Prisma, that one app everyone was talking about for a few days, then was forgot about because Pokemon GO was conquering the world, made an important announcement yesterday. Taking to its Facebook page, the company announced that offline styles will be available for Android users “soon,” while iOS users can apparently benefit from the change already. 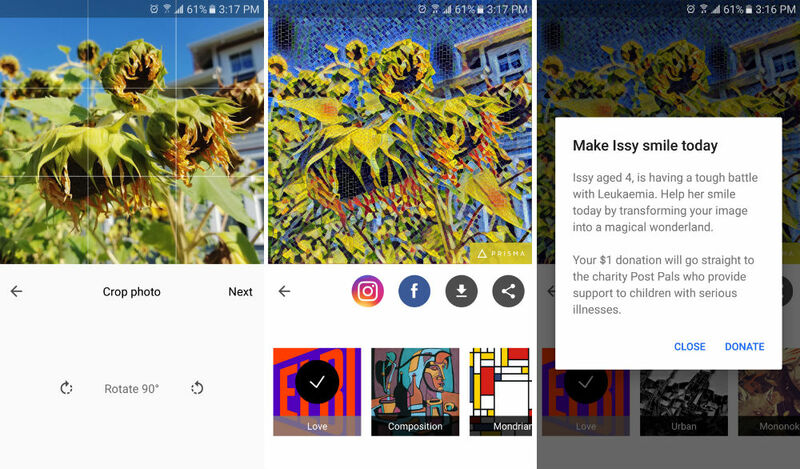 The way Prisma works, or at least, did work, was you would send your image up into Prisma’s servers, which would then use a neural net algorithm to produce a stunning work of art based on a style you liked. The process is actually quite complex, and sometimes, the servers would crash and users couldn’t utilize the service. Now, with the move to offline, a device’s onboard CPU will handle the computing, meaning we won’t need to worry about overcrowded servers anymore. It remains to be seen for Android users if this move will be seen as positive or negative. In addition to the move to bring at least half of Prisma’s styles offline, the company also introduced what appears to be a partnership with Post Pals. With this, users can choose to donate $1 to Post Pals while they style up their photos. Post Pals provides support to children with serious illnesses. Like I mentioned, the move to offline hasn’t quite happened yet for Android users, but we will let you know when it takes place.